Every lawmaker and US intelligence heads all agree 100% that Russia interfered with our 2016 election with evidence that proves that the orders came from Putin. He remains aligned with state sponsors of terrorism and dictatorships, Syria and Iran. It is common knowledge that Putin’s recent “election victory” was a completely rigged farce that will continue his own virtual virtual dictatorship while those who have the courage to speak out against him do so at their own peril. How does our US President and leader of the free world Donald Trump respond? By calling Putin to congratulate him on his victory and glowingly telling TV cameras about it for all to see. Beyond congratulating Putin on his victory, he also told Americans that he is looking forward to meeting with him in the very near future. He dragged his feet for months to implement Russia sanctions that he had been openly displeased with and argued that Congress in passing them (that he ultimately signed into law under political pressure) was impinging on his executive powers.. After UK intelligence and their Prime Minister decried that there was no question Putin was behind attempted murder on their soil, Trump’s White House refused to acknowledge it (while Rex Tillerson did and then he was fired). On the other hand, Trump has not hesitated to openly quarrel with our allies, impose tariffs on them, and recently was caught on audio bragging to donors about how he lied to Canadian Prime Minister Justin Trudeau about non-existent trade deficits with Canada. It is quite clear how he feels about Mexico. 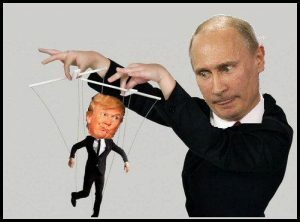 Yet his love affair with Putin continues unabated as Putin continues to attempt to undermine our democracy, all but ended Russia’s fledgling democracy, and resorts to murder to remain in power. Analysts point to the Steele dossier being true that Putin has compromising information on Trump. Perhaps his actions are the result of Trump’s extensive business dealings with Russia, including a large amount of outstanding debt to Russian banks all tied to the Kremlin. Perhaps his actions (or inaction) regarding the Russian threat is the result of Trump’s narcissism that acknowledging that Russia interfered with our election on his behalf may undermine his election victory and his legitimacy as President. Perhaps it is all of the above. Whatever the cause, the reality that our President is in the back pocket of a ruthless dictator that routinely resorts to murder and seeks to weaken US democracy and our position in the world should trouble every American regardless of party affiliation.